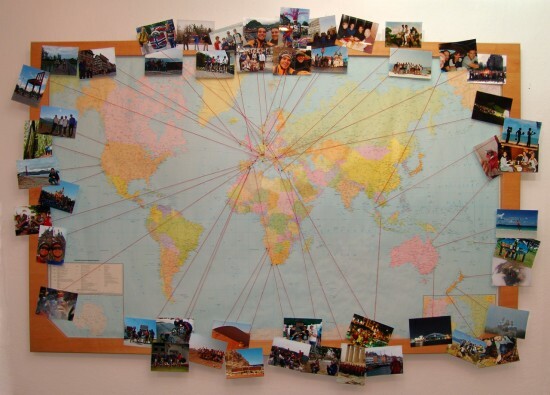 when i moved into the new apartment, my aunt and uncle gave me a 170×110 cm world map for my hallway, and i immediately knew what i wanted to do with it: mark every trip abroad and append a photo. over the holidays, i’ve finally been able to work on this project again. here’s the current status, covering (i think) all destinations since 2004, plus a few bonus vacations dating as far back as 1995.
funny side story: i searched a whole bunch of shops until i found the perfect type and colour of string. when i asked whether 120 m (1 roll) was really the smallest amount i could buy, the lady at the counter asked me how much i needed and what i needed it for. i replied “to mark something on a map”, and she quickly inquired “are you with police?”.